Friday, February 16 is Chinese New Year and we’re celebrating along with partner Panda Express. 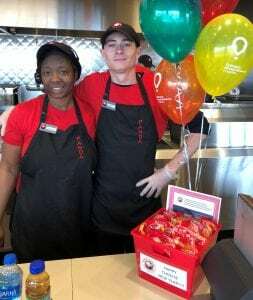 A partner of Children’s Miracle Network Hospitals, Panda Express has raised more than $37 million since 2007. Their direct impact to United Regional, since their Wichita Falls store opened in June 2017, is more than $3,114! To celebrate, we’re giving a traditional red envelope to inspire good luck and fortune in the coming year! Donate at the register at Panda Express to help kids treated at United Regional. Every time a bell rings after a donation is given helps make miracles happen at our hospital. Previous post: Union Square Credit Union donates to CMN!